With reference to Mr. Sunir and Mr.Gaghan producer of Billa – II tamil film, I’m Johnson – PRO of tamil film industry would like to have your interview published in all magazines and newspaper of Chennai (India) for the film BILLA – II promotions. Kindly reply my mail with your brief answers for the following questions below as aoon as possible. 1, What is all about this special stunt fight you mastered in this film Billa – II ? 2.How many days it took to shoot this fight and what are the unique technician used in this fight? 3.Your experience with the Director and other technicians in this film Billa – II ? 4.Your experiece with the hero Mr,Ajith ? 6.What feel about the Indian cinema especially Tamil film Industry and the stars you heard ? 7.Your future projects in Tamil / Indian cinema you going to work? If you would like to share more information please mail to me or contact me on my mobile number . Hello I am Kecha Khamphakdee. I am the stunt coordinator of the Jaika Stunt team. I will try to answer your questions as best I can. 1) What makes the fight sequences so special in Billa 2 is the fact that you have such amazing talent performing the action. It’s not possible to film good action without good performers and the actors in Billa 2 are definitely more than just good. They’re fantastic. Obviously you have Ajith Kumar who brings great intensity and focus to all his work, especially the fights. His moves are very sharp and powerful. You also have Vidyut Jamwal who is very skilled in martial arts and acrobatics. We utilized a lot of his acrobatic abilities in the fights. In choreographing for both of them we were able to collaborate our ideas and bring out choreography that works well for each person and showcase their unique strengths. 2) It took a few days to film each fight. The most difficult sequence for us was when filming in Georgia. The weather was extremely cold and our location was suddenly hit by a huge snowstorm after 75% of the sequence was completed. We had to film it all again! Even so the Georgian stunt team were amazing and Vidyut took it like a champ. We could hardly move because it was so cold but he was jumping and kicking and flipping with no problem. Very amazing talent. 3) It was great working with director Chakri Toleti. He is very detailed with a solid idea of what he wants from each sequence and will film until everything is perfect. He gave us a lot of freedom to design our fights which we truly thank him for. The entire crew was a pleasure to work with and our team made many new friends during this film. We hope to be able to work together again soon. 4) Mr. Ajith is a very charming man. Very polite and respectful and very friendly to everyone on the set. Our team has worked with him before so it was great to get the chance to work together again. He’s willing to try almost anything as he is very skilled in various extreme sports. This made it easy for us to work together to design our fight scenes. What is also amazing is how he is able to move so sharp and powerfully. Definitely an honor to work with. 5) I have been working in the movie industry for about 20 years now. My style of action leans more towards the realistic and hard hitting style that Thailand is well known for. However, when choreographing fight scenes I try to utilize more than just Thailand’s Muay Thai style of action. When possible I try to incorporate elements from different styles of martial arts which makes the fights more interesting. My team is also very skilled in wirework techniques and we strive to make our wirework action as innovative and exciting as possible. 6) My team the Jaika Stunt Team has worked on numerous Indian films especially Tamil films. What is very great about the Tamil film stars is how down to earth they are. They are very respectful and also very talented. Some may have action experience and some may not but they all give it 110% when we design the action for the films. It is a very friendly atmosphere in the industry and we are always excited to work on an Indian film. Indian films are big on action and we hope to bring more to the action industry here. I personally would like to push more focus on the performance and realistic action, and less on the quick cuts seen in a lot of films. I want to showcase the actors and their talent honestly and not hide behind too much fancy editing, quick cuts and extreme closeups where you can’t tell what is going on. The actors and performers work so hard and it would be a shame to not fully show off their hard work. I would like to bring a little more rawness and grittiness to the action in the industry and hopefully will get the chance to do so in future projects. 7) We worked on Mr. Nokia starring Manoj Manchu which was released recently. 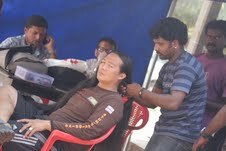 We also designed the action on Vishwaroopam starring Kamal Hassan. And we just finished work on Zilla Gaziabad. As for future projects there are a few in pre-production but we aren’t able to divulge any details just yet. But if you are looking for top notch action from the Jaika Stunt Team then look no further than Billa 2. I hope this is what you are looking for. If you need more details please ask.